After a long, chilly winter, spring has finally arrived in Houston. If you haven’t already, you might soon find yourself dusting off the lawn mower and cleaning your patio furniture in preparation for the warmer months ahead. 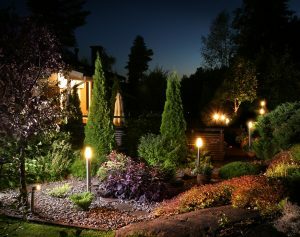 You might even be thinking about upgrading your outdoor lighting, but may not be quite sure where to start. With more than 50 years of experience helping homeowners enhance their exterior lighting design, the experts at M&M Lighting are here to answer all of your questions and help you find the right exterior fixtures for your home. Contact us today to schedule your appointment with a sales consultant! 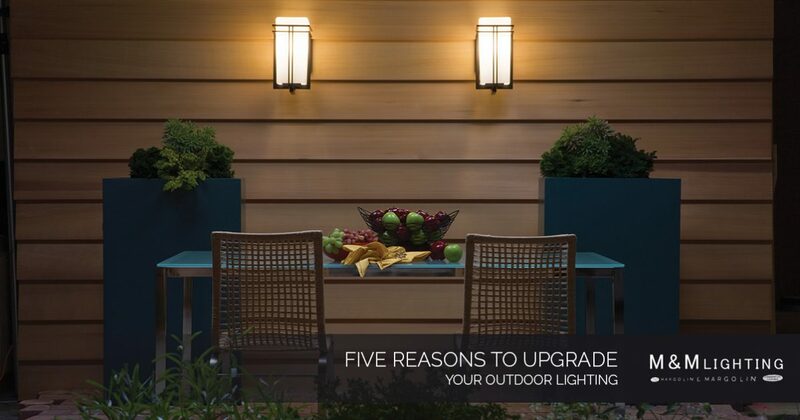 Are you still on the fence about whether or not your outdoor lighting could use a facelift? Upgrading your exterior fixtures comes with many benefits, and we’ve highlighted five of them below. If you have exterior features that are improperly illuminated, or not lit up at all, you could be missing out on a lot of memories with family and friends after dark. Having the right fixtures in the right places can have a big impact on how you use your outdoor spaces once the sun has gone down, and upgrading your outdoor lighting can allow you to take advantage of your outdoor living spaces. Spring is the perfect time to install string lights in your gazebo or add post lights to that extended patio you added a few years back. When your home is adequately illuminated on the outside, you and your family can experience the benefit of enhanced safety and security inside. Thieves are less likely to target a home that is well-lit, as there will be fewer places for them to hide when you have the right amount of deck and patio lights. In terms of safety, functional step lights and pathway lights are critical outdoor lighting features that allow you to clearly see where you are walking after dark, and installing these can help prevent injuries from tripping or falling. The way you decorate the inside of your home says a lot about your personal tastes and style preferences. 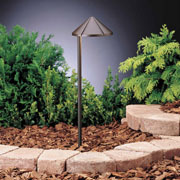 Upgrading your exterior lighting can be a fun way of carrying your personal design sense into the great outdoors. If you still have the contractor-grade fixture adorning your exterior entryway, replacing it with a decorative ceiling mount fixture will is a sure way to inject instant style to the outside of your home. For homeowners who are tired of the boring lights on either side of their garage, installing new wall mount fixtures can make all the difference. Aside from providing functionality, security, and an opportunity to inject your personal sense of style to the outside of your home, upgrading your outdoor lighting can give your home more curb appeal if you’re trying to sell it. Prospective buyers may drive by your home at night, and if your house number is not adequately lit up, your house could be difficult to find. Additionally, strategically placed landscape lighting and accent lights can help enhance desirable features around your property, allowing you to showcase your home long after the sun has set. Have you transformed your lackluster patio into luxurious outdoor living space for grilling, dining, and entertaining friends and family? If you don’t have the right fixtures in your new outdoor living space, you may find that your parties are winding down before you are ready for them to end, and the right fixtures can enhance your entertainment space. Installing a functional outdoor fan will help keep you and your guests cool while the right chandelier or hanging lights can provide the illumination you need to continue entertaining into the early morning hours. If you are ready to upgrade the outdoor lighting on your Houston-area home, then the knowledgeable team at M&M Lighting is here to help! We have more than 50 years of experience in the lighting industry, and our sales associates would love to speak with you about your budget and design preferences to help you find the right fixtures for your exterior lighting needs. Schedule your appointment with a friendly team member today, or swing by our Houston showroom when you have time! We look forward to meeting you!